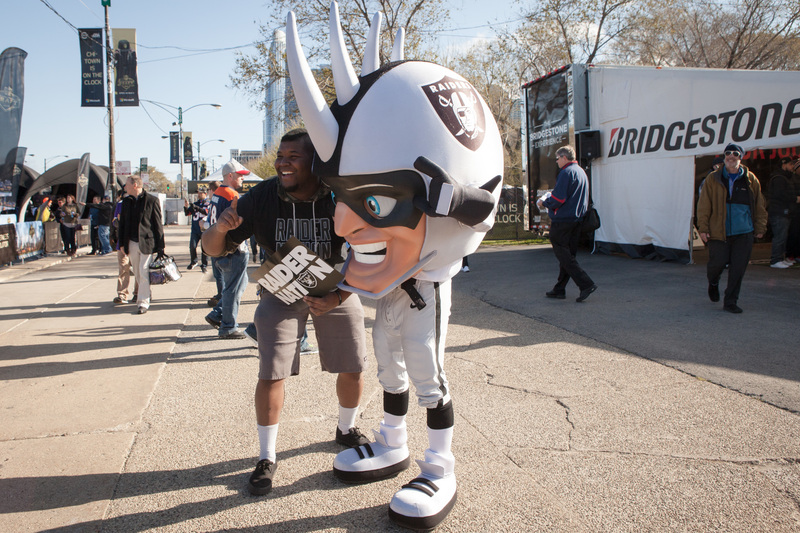 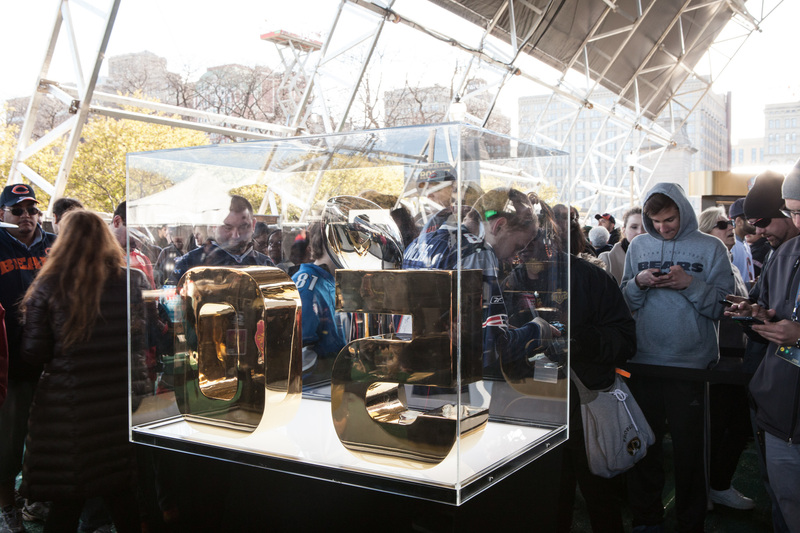 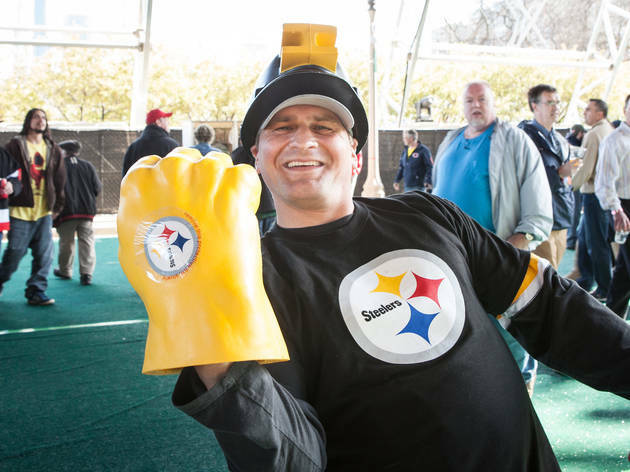 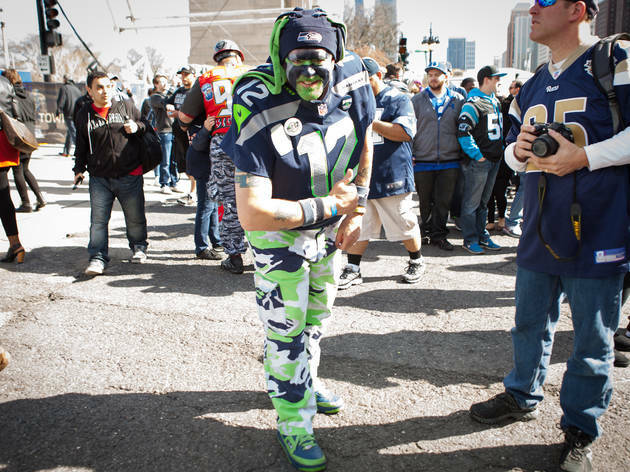 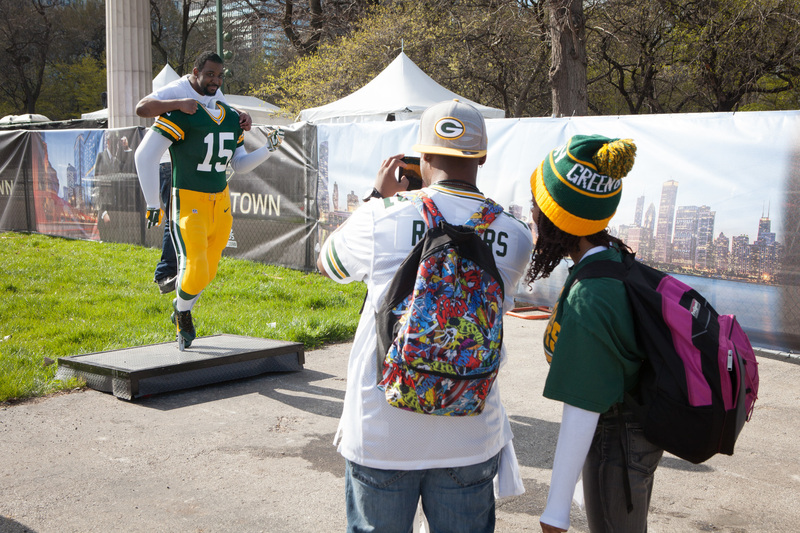 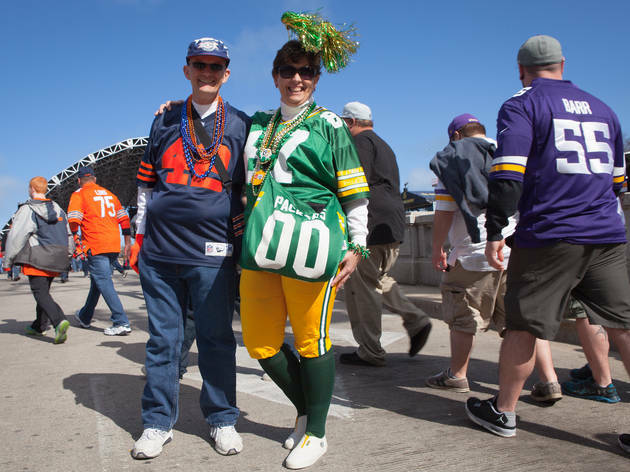 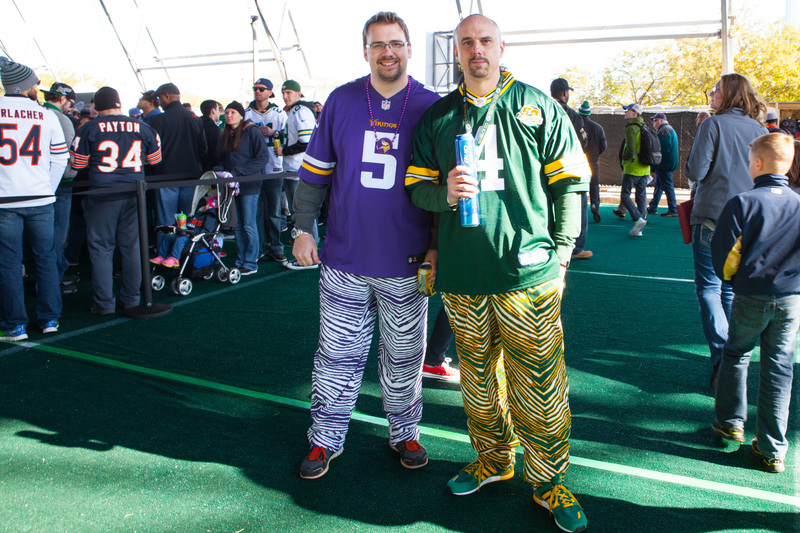 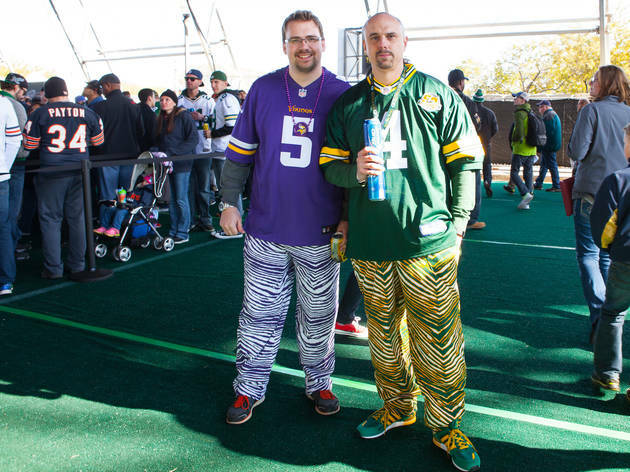 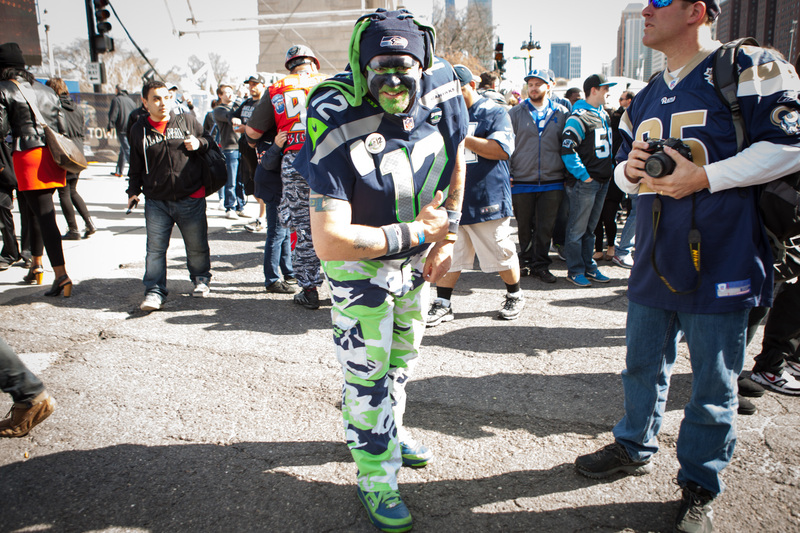 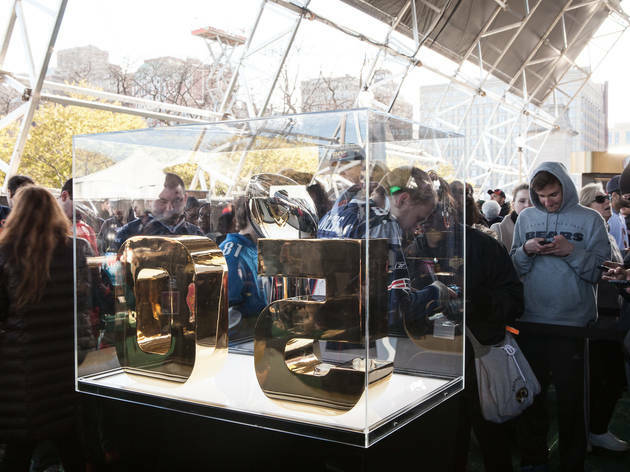 Football fans show off their team spirit in Grant Park at NFL Draft Town, April 30, 2015. 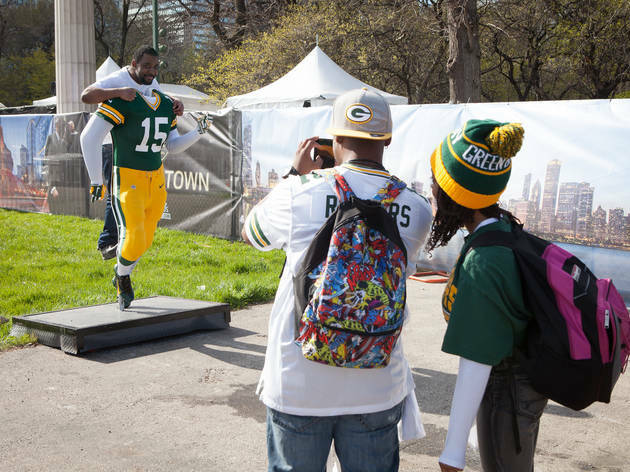 Fans decked out in team jerseys, sweatshirts and T-shirts streamed into Grant Park this afternoon as NFL Draft Town opened to the public. 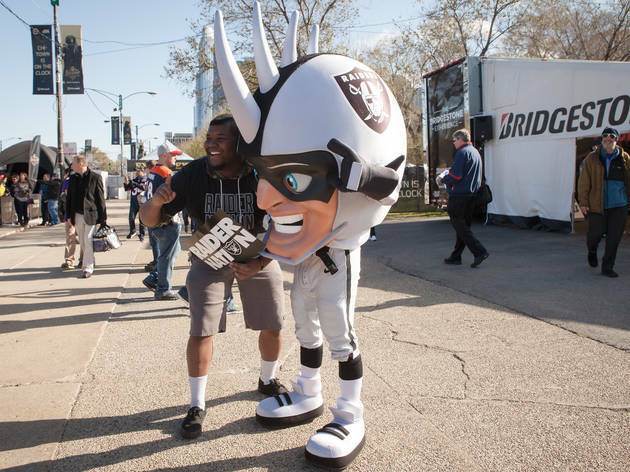 The fan festival runs through Saturday, giving attendees a chance to celebrate the NFL Draft, which is taking place this weekend at the nearby Auditorium Theatre. 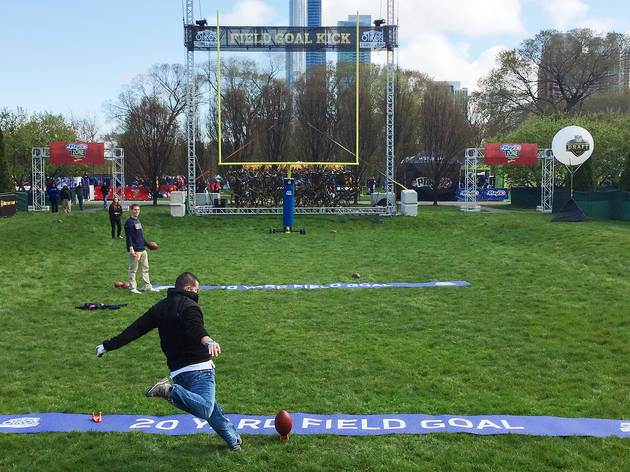 We walked through the giant arches that have erected in Grant Park and brought back photos and tips for anyone planning on visiting NFL Draft Town this weekend. 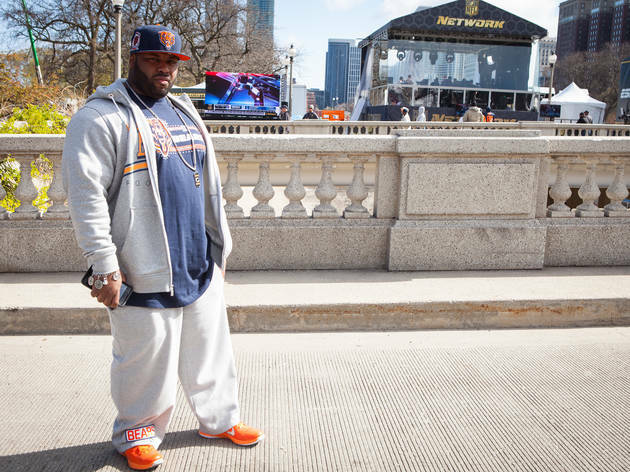 Portions of Michigan Avenue and Wabash Avenue are closed to accommodate the festival and the NFL Draft, so traffic in the Loop is—to put it lightly—screwed. 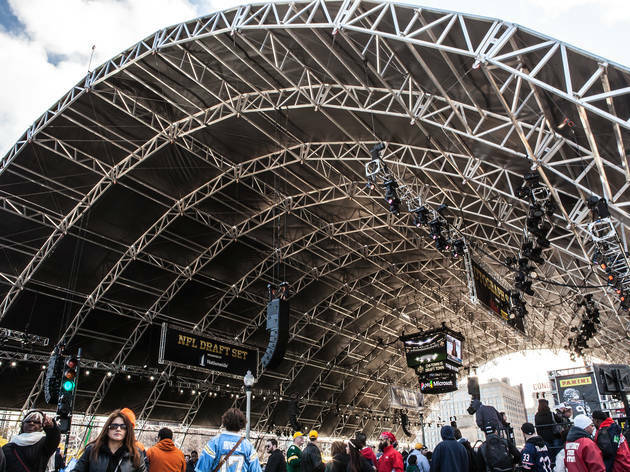 If you want to get to the festival, stick to public transit. 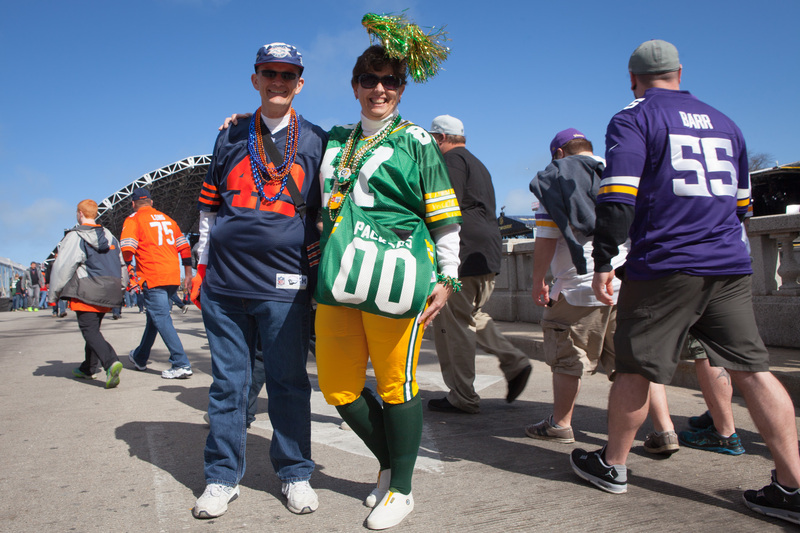 Lining Columbus Drive, you'll find club houses devoted to each of the league's 32 teams. 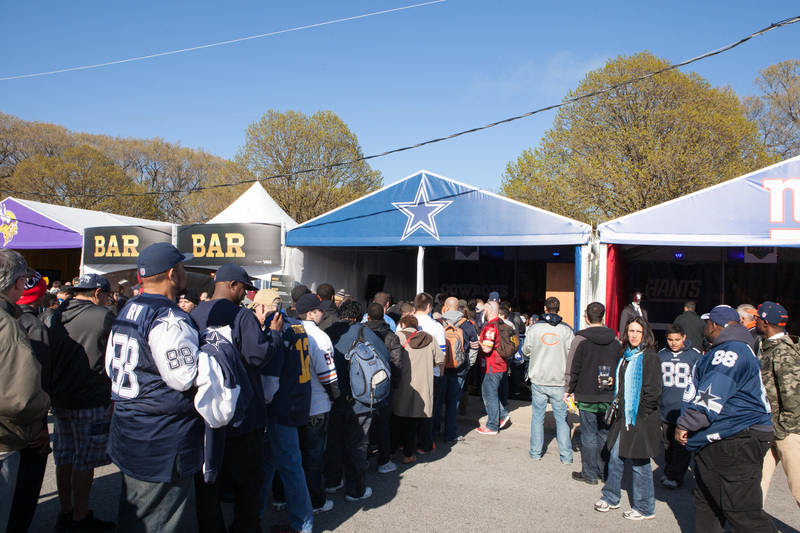 Inside the club houses you can purchase exclusive merchandise and spend time with fellow fans. 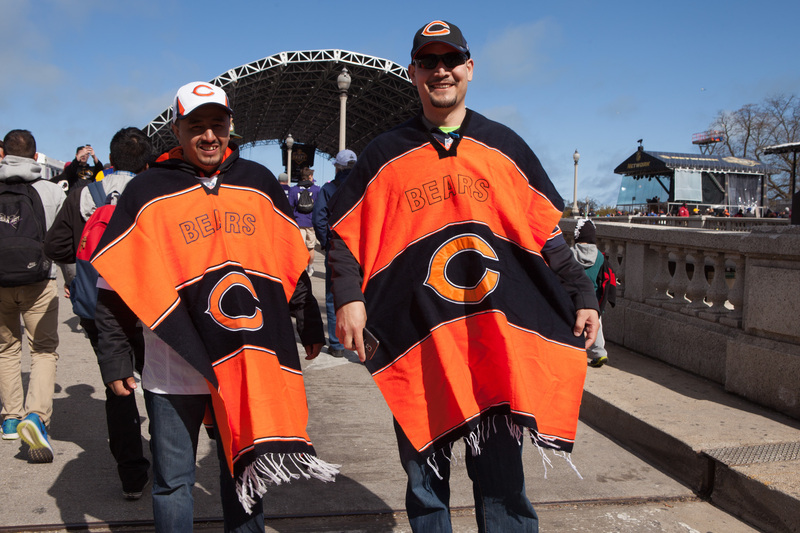 If you're a Bears, Cowboys or Packers fan, you'll probably have to wait in line. 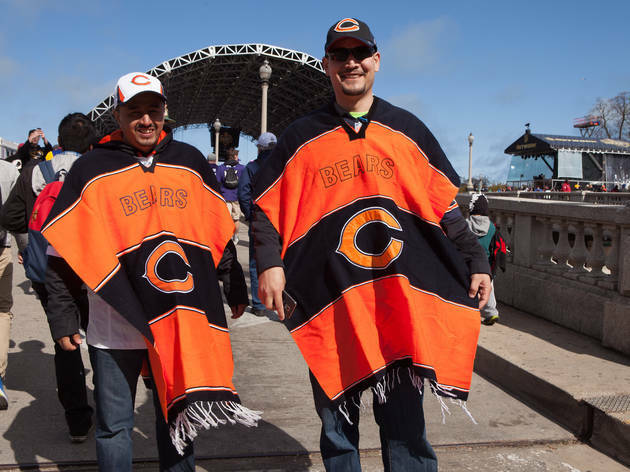 Dolphins and Browns fans are in luck—those club houses looked pretty empty during our visit. 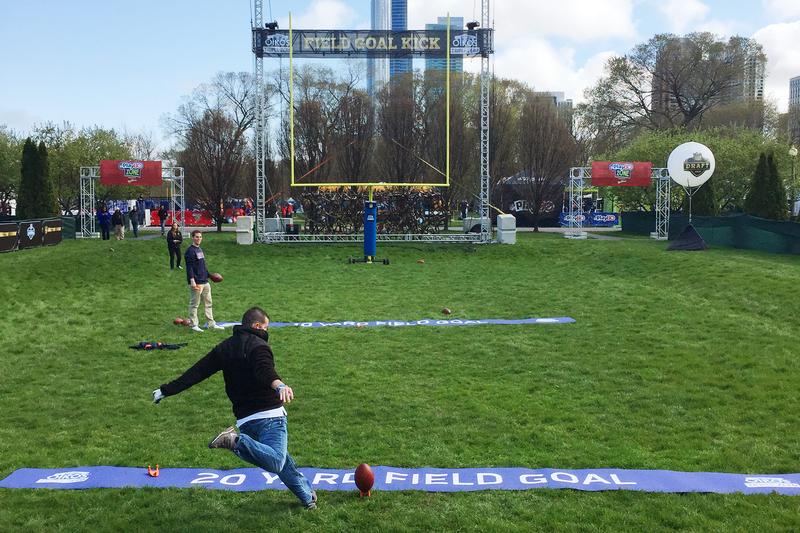 Want to whiff a few field goal kicks in front of a crowd of judgmental dudes (the male to female ratio is at least 10:1)? 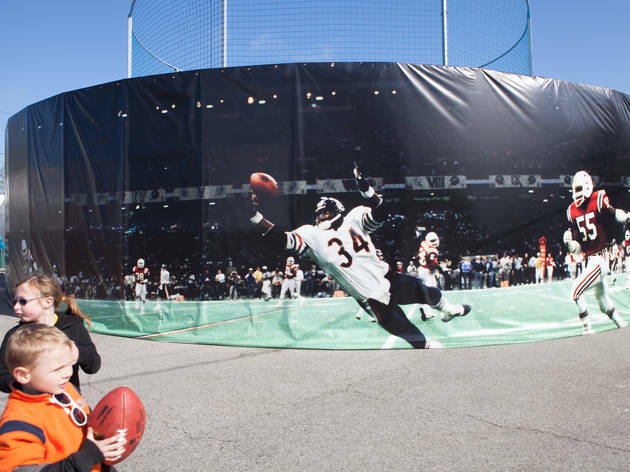 Maybe you'd prefer to run a 40-yard dash? 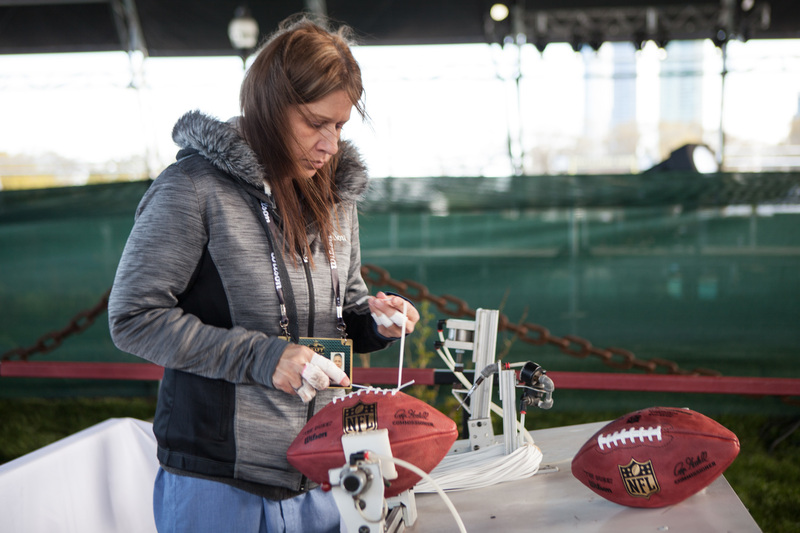 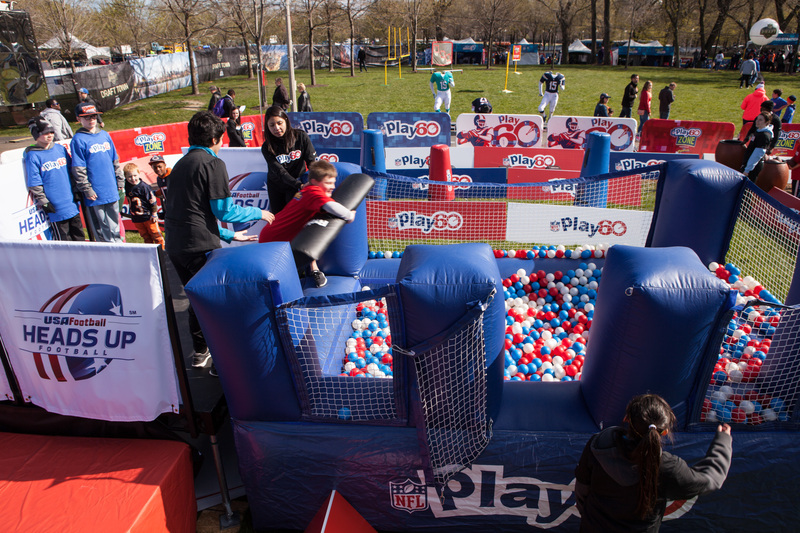 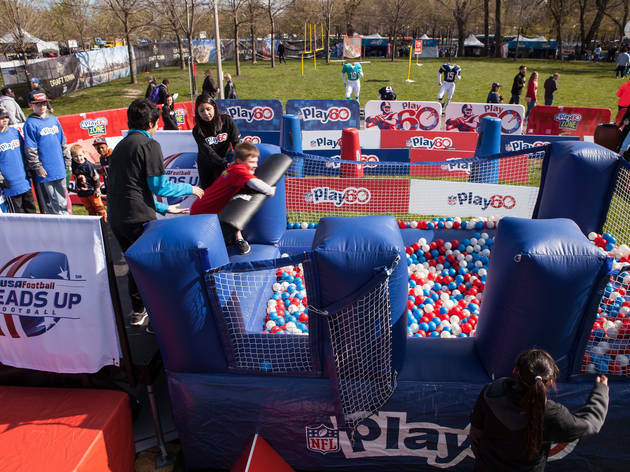 The festival's Combine Corner allows visitors to participate in the same physical activities as NFL Draft prospects. 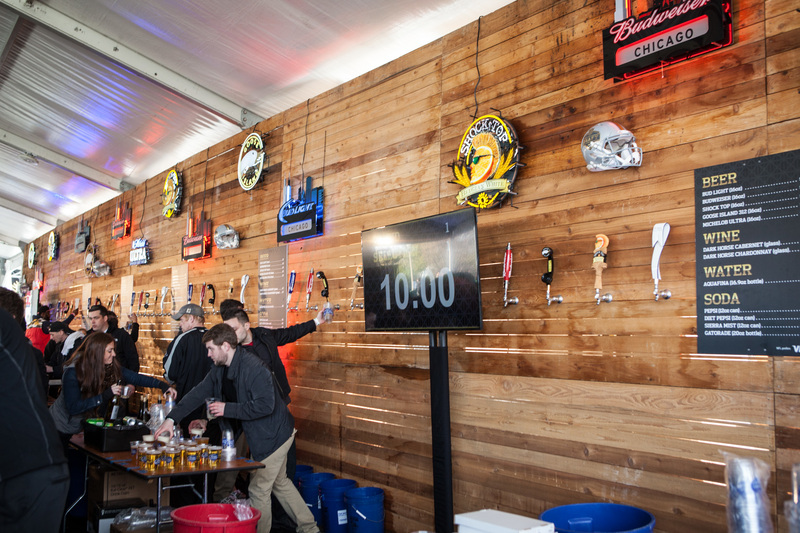 We recommend visiting this area before you grab a beer at the Draft Tavern. 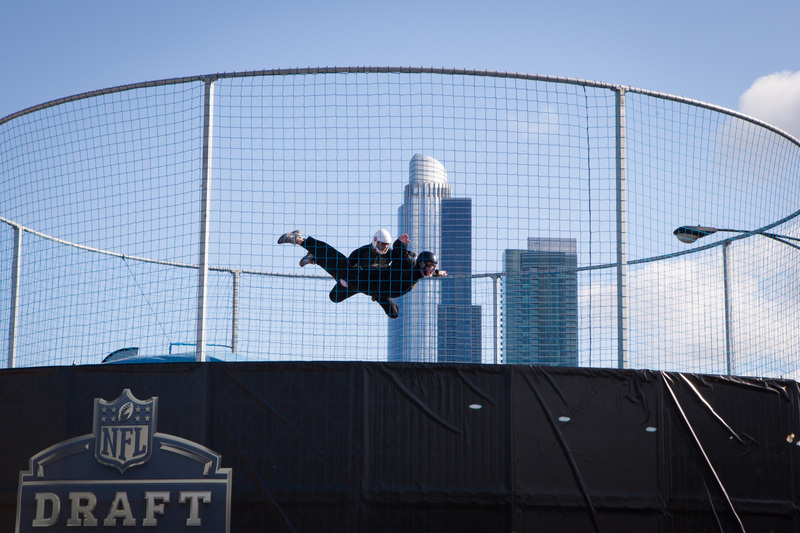 If you don't mind waiting in line, Draft Town's "Sweetness Simulator" gives fans the opportunity to suit up and float in the air above a giant fan. 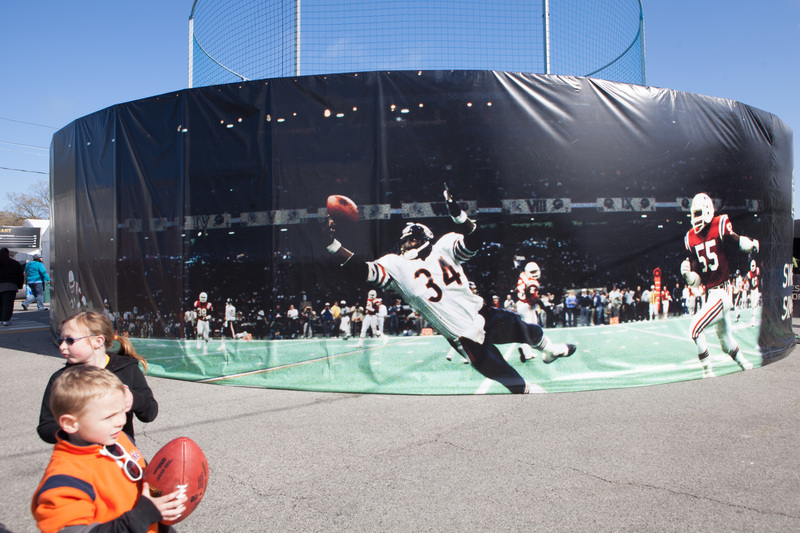 It's kind of like indoor skydiving, except you're outside and everyone is watching you. 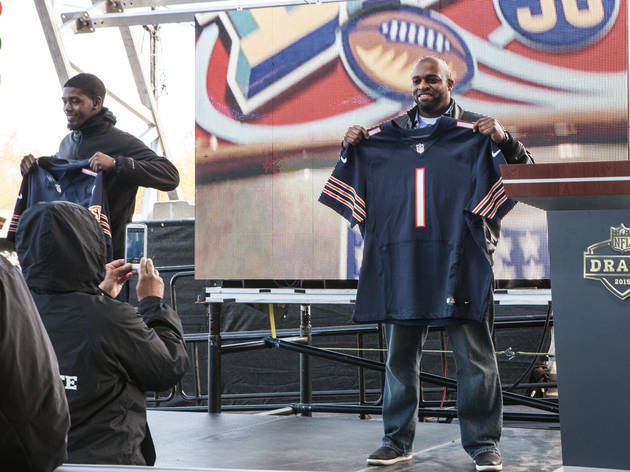 Ever wondered what it would be like to be picked in the NFL Draft? 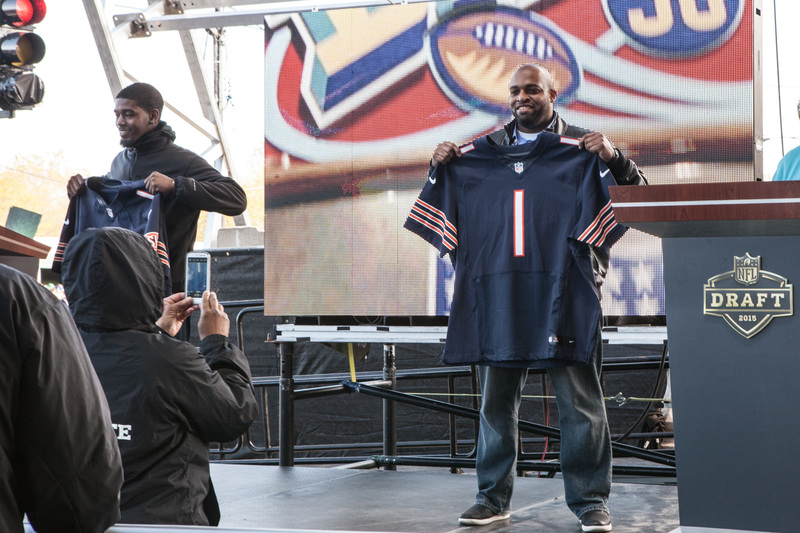 Guests can engage in some public roleplaying by holding up a jersey and standing on a podium. 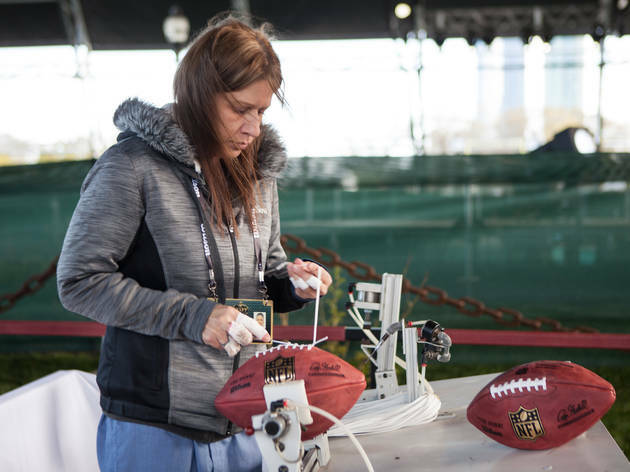 If you can't handle the pressure of becoming a fake draft pick, there are uniformed player body-casts scattered throughout the festival that you can step into for a photo. 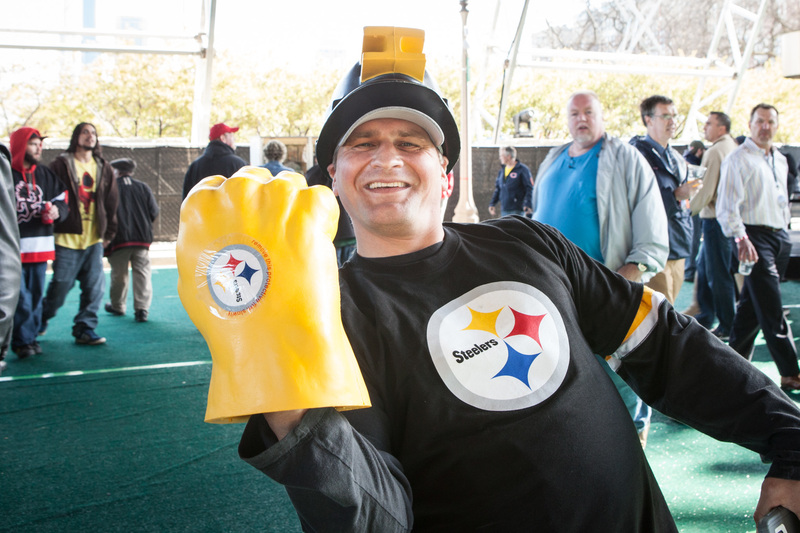 All of these fan activities are going to make you work up an appetite. 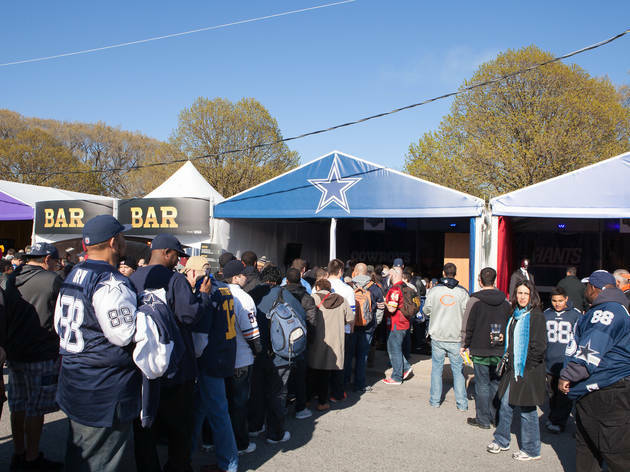 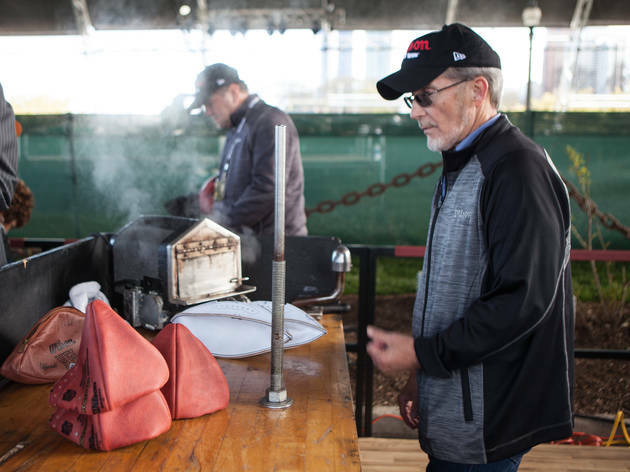 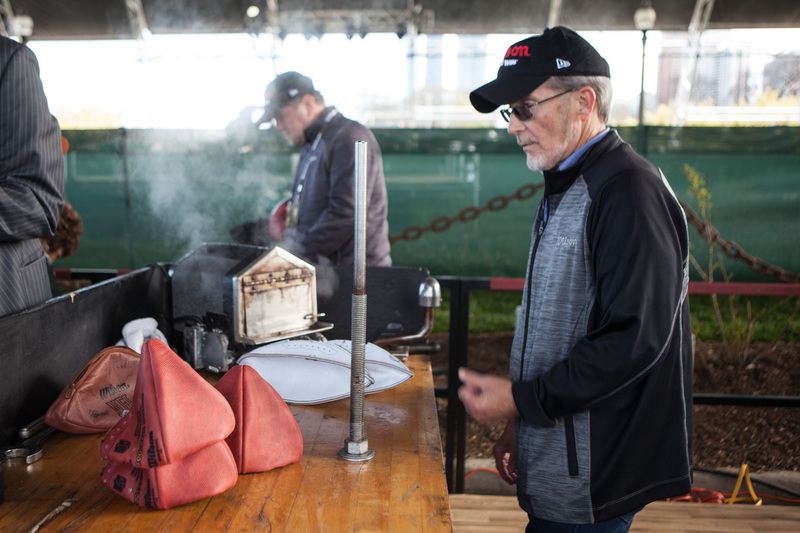 Luckily, there are a variety of decent food options on-site, including grub from County Barbecue, Wow Bao, Chubby Weiners and Billy Goat Tavern. 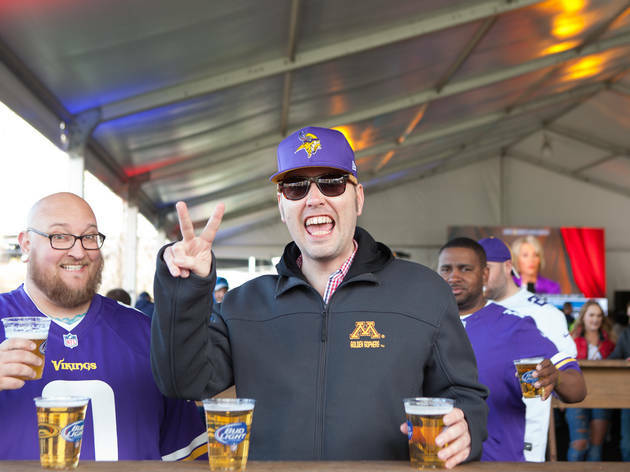 You can wash it all down with a beer from the Draft Tavern, which features 50 taps stocked with Budweiser products like Bud Light, Shock Top, 312 Urban Wheat Ale and more. 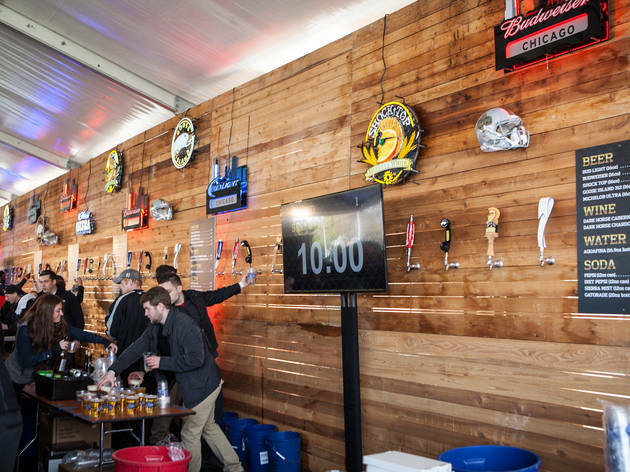 At $7 for a 16oz pour, you can afford a few rounds. 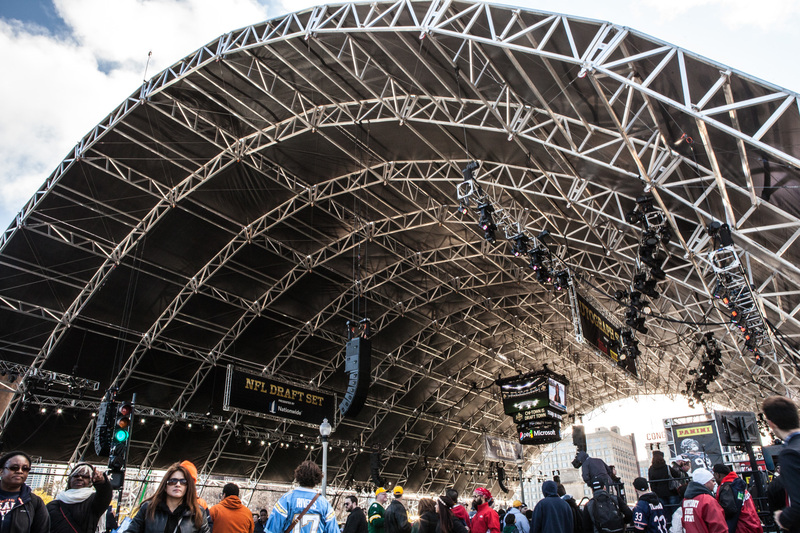 The NFL Draft Town stage is pretty tiny. 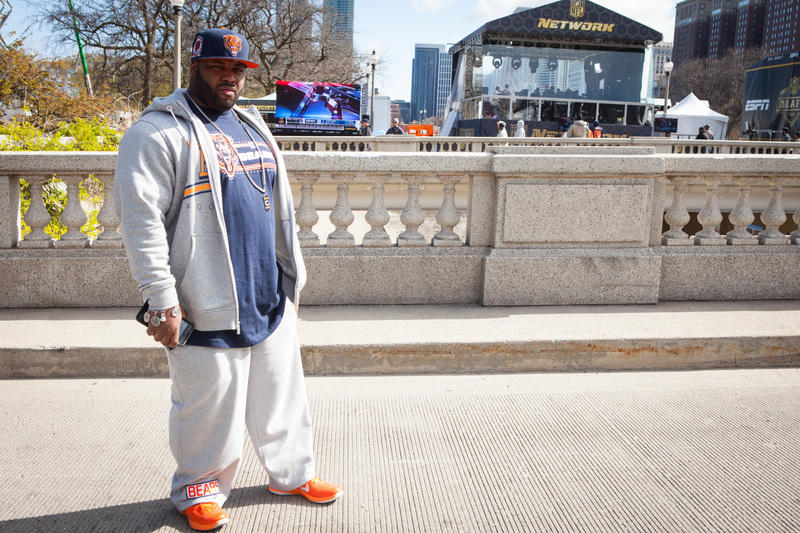 We're guessing that a lot people will be coming to the festival on Saturday to see the American Idol winner close out the event at 8:30pm. 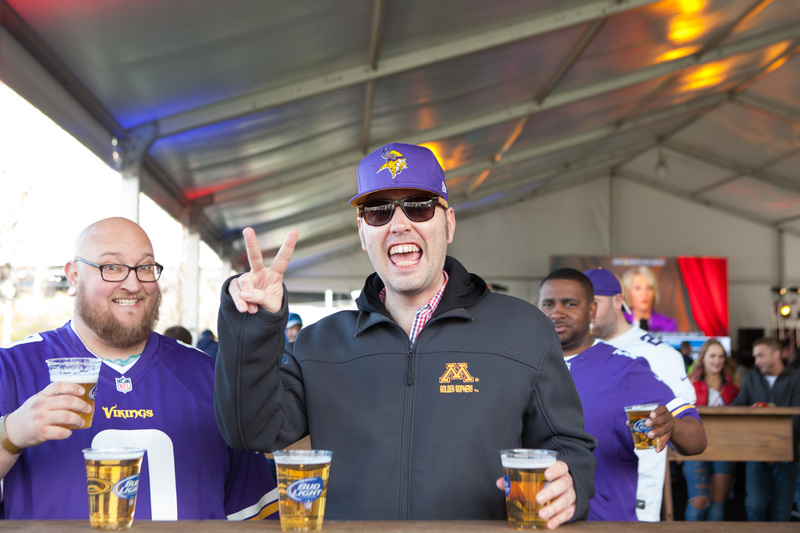 Our only advice is to arrive early and claim your spot.